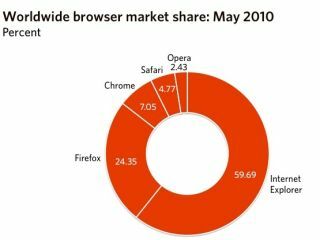 Internet Explorer continues to lose market share, according to the latest data on browser use trends, with fewer than 6 in 10 people now using Microsoft's web browser. The latest data from web analytics firm Net Applications shows that fewer than five per cent of web browser users worldwide now use Microsoft's aging Internet Explorer 6. A closer breakdown of the figures actually reveals that Microsoft's Internet Explorer 8 is in fact growing faster than Google Chrome, although that growth is tempered by the massive shift away from Internet Explorer 6. Between April and May, Internet Explorer dropped 0.26 percentage points overall, from 59.95 per cent to 59.69 per cent, according to Net Applications. In comparison, Chrome was up 0.32 percentage points from 6.73 per cent to 7.05 per cent. Google recently announced that its Chrome operating system would be launching later in 2010.